When it comes to recreational watersports, thrill-seekers and casual boaters alike will agree that cruising through the waves can be a bruising experience for your spine. What many boaters don’t realise is that over the long-term, high-speed watercraft can expose them to a dangerous accumulation of impacts that can cause chronic pain and debilitating injuries. Referred to as mechanical shocks, wave impacts and the hazards they pose have not escaped the attention of major sea-faring organisations and governments. In fact, through its vibration directive 2002/44/ EC, the European Union has gone so far as to impose strict shock dosage limits to protect its workers. With or without legislated exposure limits, fleet agencies around the globe are taking action. Navies, Coast Guards, and Marine Police Forces increasingly turn to shock-mitigation technology to protect their crews. Shock-mitigating suspension seats are a cornerstone of their safety approach, and in recent years the increased focus on testing and performance has dramatically changed the marine industry. In the military sector, SHOXS Seats has emerged as the global leader. The company earned its standing through its dedication to engineering, performance, testing and customer support. SHOXS is a strong advocate for open and transparent performance measurements because competition breeds excellence. SHOXS actively contributes to marine seat standards development, most notably through its participation in the drafting of an ISO test standard. Attention to scientific measurements has earned SHOXS significant growth. For example, in a groundbreaking seat-testing competition held in 2015, the UK’s Ministry of Defense (MOD) evaluated 16 seats from around the world. The MOD was looking to equip a new generation of Royal Navy boats with the best protective gear they could find. 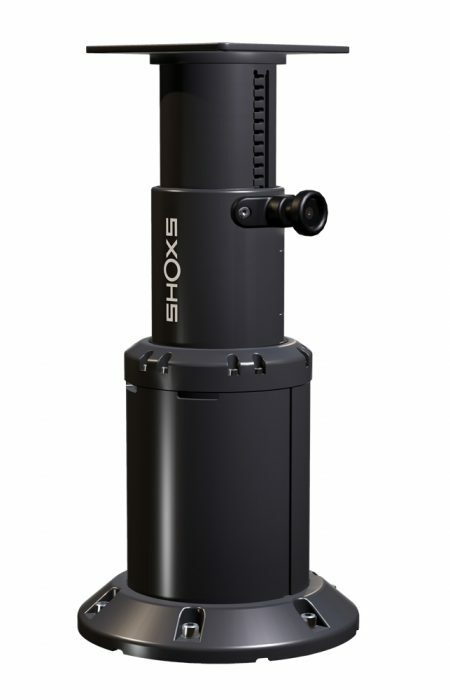 Based on a combination of performance in the laboratory and on the water, SHOXS was awarded the contract. SHOXS’s products have been optimised thanks to a performance-oriented philosophy combined with extensive experience working with the world’s most advanced maritime fleets. 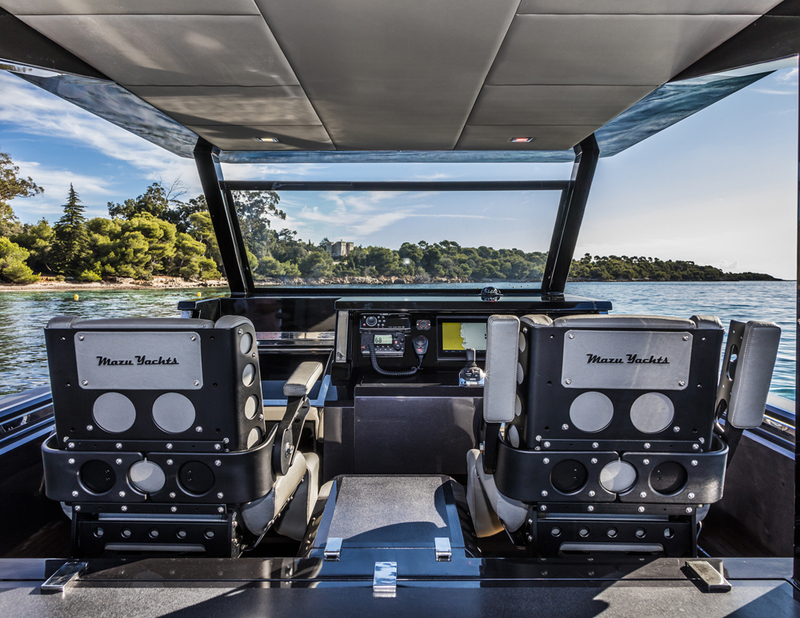 This wealth of experience has shaped SHOXS’s new seating line, the company’s first foray onto recreational boating platforms. Now, for the first time, the lessons SHOXS has learned from the world’s most demanding fast-boat operators have been fused into marine seats for the leisure and superyacht market. Known as the X Series shock-mitigating pedestals, SHOXS’s newest offering will change the way boating enthusiasts think about their seats. Sleek in profile yet robust in design, SHOXS’s X4 pedestal provides 4.4 inches of suspension travel for use in mild to moderate boating conditions. For more extreme boaters, SHOXS’s new X8 provides a lengthy 8 inches of travel, easily absorbing the most punishing impacts. The pedestal’s compact footprint makes it suitable for mounting in confined spaces, and it can even be recessed in deck-mounted boxes. With configurable seat-tops and optional height-adjustments, these pedestals are ideal for new deployments and refits alike. Despite their compact size and refined look, the X Series pedestals do not compromise on their suspension. They feature the same family of heavy-duty shock-absorbing isolators that SHOXS builds into its military seats. The long-travel, wide-body isolators that suspend these pedestals are durable and have proven their worth at sea. The industry’s leading shock-mitigation technology is now accessible for luxury yachts, private tenders, adventure RIBs and leisure craft. Why settle for less?